Frequently consuming coloured foods like coffee, tea, cola, or red wine stains your teeth over time. Nicotine and tar in tobacco stains the necks of your teeth above the gum line, giving them a yellowish-brown colour. Accumulated dental plaque and calculus formed on the teeth due to poor dental hygiene can cause discolouration of teeth, which varies between grey, yellow, black or brown. Fluoride is known to cause teeth discolouration. Excessive usage of fluoride products such as mouthwash, toothpaste, or drinking water with high fluoride content can cause your teeth to be discoloured. Giving certain antibiotics to children whose teeth are still developing can stain their teeth, which will carry into their adult life. Teeth can be discoloured from the inside out due to bleeding within the tooth itself, which decomposes and forms a blueish-brown stain. A small number of people who suffer from congenital issues may also have discoloured teeth. The outer layer of the enamel on our teeth gets eroded when we turn older, exposing the dentin. As the dentin also turns yellow with age, this will cause our teeth to appear stained. Extrinsic stains are best removed through routine scaling and polishing, while intrinsic and age-related discolourations can be treated via professionally prescribed teeth whitening procedures. Achieve whiter teeth in our dental surgeon’s office. Each session will take around an hour. Before the procedure, routine scaling and polishing will be done to maximise contact between your teeth and the whitening gel. 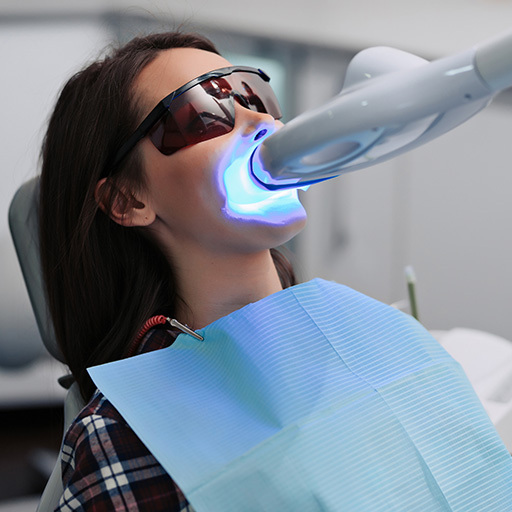 The dentist will apply the whitening gel onto your teeth, which is then “activated” by laser light. Multiple sessions may be required, depending on the state of discolourisation of your teeth. An alternative to teeth whitening in a dental office, Home Bleaching kits may be a more convenient option for some. Compared to In-office Bleaching, results for this are more gradual, which can be seen after a few weeks. Dental impressions will be taken to create customised trays for your teeth during your first visit. At the second visit, the trays, together with syringes of bleaching gels prescribed by the doctor, will be given to you. Depending on your teeth’s condition and the bleaching gel’s concentration, you will be required to bleach your teeth between 20 minutes to 2 hours each day.